Now that we are at the fountain, looking straight ahead down Harbor Road, you will see Perry Green on your left. 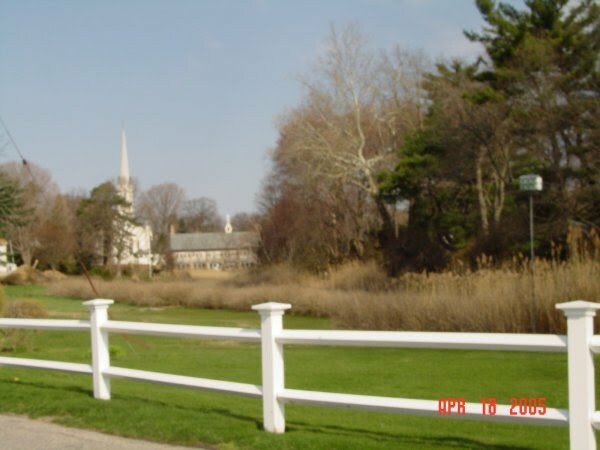 The Green is a favorite spot of congregation for strollers and bikers who take a break from their pursuits to sit down on one of the benches facing the Mill River and the green expanse of the Fairfield Country Club’s golf course on the opposite bank. The white houses you see on your left are lovely, large colonial homes with wide decks and airy porches. In summer, the gardens of these homes are filled with glorious color and delightful fragrance as lilac fronds wave in the air and roses ramble over picket fences. Right opposite the Green are the three grand mansions that belonged to the three Perry brothers who made their fortune trading up and down the North Atlantic coastline using Southport Harbor as the base of their operations. Take a look at two of these homes that occupy the most coveted location in the village. Here is the grand old Perry Mansion. Notice the imposing Neo-Classical columns of the porch, so reminiscent of the ancient civilizations of Greece and Rome. Notice also the white picket fence that encircles the entire estate. In the summertime, there is an abundance of roses that spills all over the fence, perfuming the air quite splendidly indeed. The street on the right of the house is Center Street. It is one of the prettiest streets in Southport Village and has gracious homes that are sprucely maintained and deeply loved by their owners. Notice the stepping stone at the extreme left of the picture (above). It is a two-tiered step stool that dates back to colonial times when ladies wore long, stiff, crinoline skirts and traveled through the village in horse-drawn carriages. These step-stones were used to assist them as they stepped off the carriages and walked towards the harbor to take the air of an evening. Here (left) is the smallest of the three Perry houses. It is located on the extreme left of the Green. 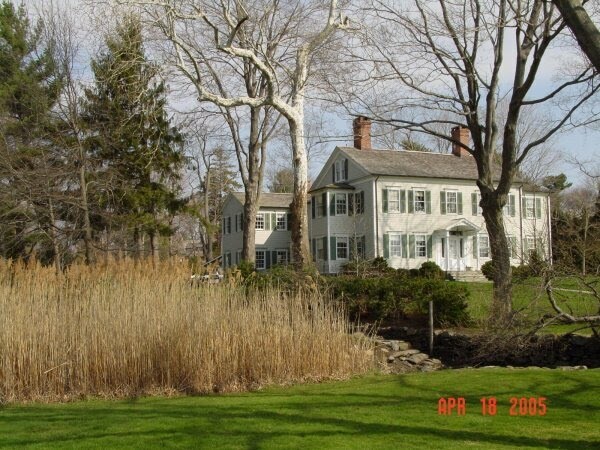 Notice the color of the clapboard walls–always white. 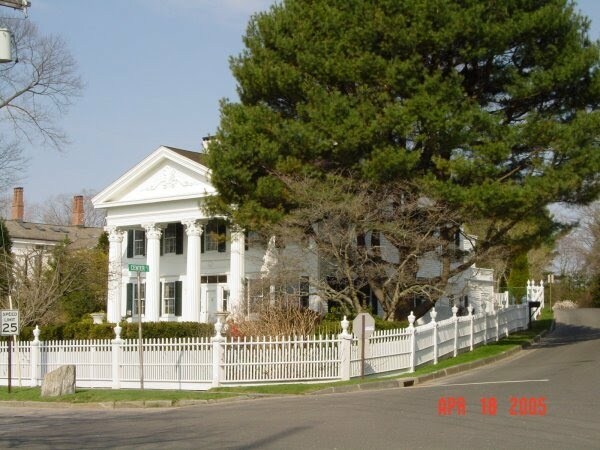 This coloring gives almost all the traditional homes of Southport a uniform identity–the identity of white Anglo-Saxon Protestant New England homesteaders who attemtped to re-create a small pocket of England in every region of the New World in which they settled. Just to the immediate left of this Perry estate is a white picket fence (as seen below). I love to stand here and take in the sight of the white spire of Trinity Chruch that is located on Pequot Avenue which runs parallel to Harbor Road. On spring mornings, when there is a crispness in the air and when the twittering of the birds is heard again after the silence of the long North Atlantic winter, I like to pause here and listen to birdsong. Our little feathered friends are busy creatures at this time, hunting and foraging for the materials with which to line their nests. As they fly frantically from tree to tree that still await the arrival of their lush foliage, I watch their flurry of activity which never fails to remind me that I ought to be in my garden too preparing for the arrival of summer’s great bounty of flowers. This is one of the most bucolic sights in all Southport–the single spire of the wooden Trinity Church that towers above to reach for the Heavens (right). Notice the dove cote on the right end of the picture. It is a warm and hospitable shelter for the many birds that seek a nesting box for the spring season. Can’t you just feel the tranquility of this early spring morning? Now imagine the bells tolling gently at sundown to ring the hour of vespers. Trinity Church hosts a number of religious and cultural events all year round. I especially love the annual sing-a-long when amateur and professional singers alike congregate in the church’s interior to belt out Broadway tunes and songs from Gilbert and Sullivan operas. During the Christmas season, the church hosts performances of Handel’s Messiah. We will cross over Westway Road now and continue on our way along Harbor Road. 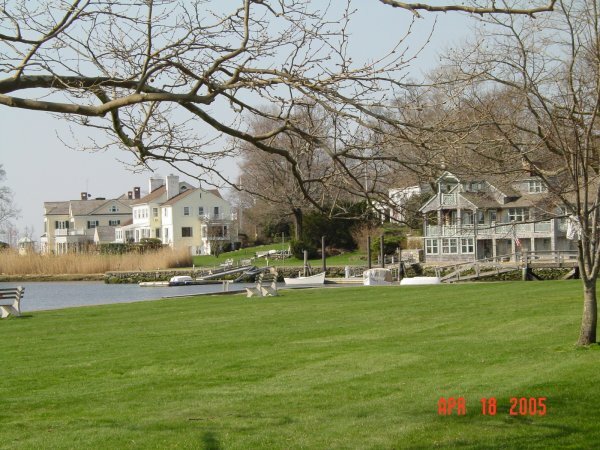 The Mill River flows gently on our left, almost accompanying us silently as we follow its course towards the Old Yatch Yard at which point it joins the waves of Long Island Sound. 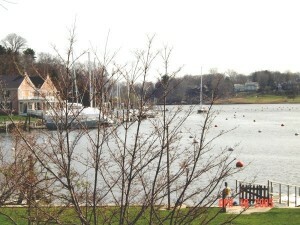 From this point on our walk, you can look across the harbor and see the twin brick red buildings (below right) that comprise the Pequot Yacht Club. A few yards ahead, on your left is this home (left) which is one of my favorite houses in the village. What I especially love is its location on the banks of the Mill River and its very subtle coloring. The walls are a soft creamy yellow and its shutters are emerald green. All wooden trim is pure white. The combination of shades makes the home looks fresh and crisp, no matter the season or the time of day. Let’s continue to walk towards the end of Harbor Road. On your right, you will see another magnificent copper beech tree said to be over 350 years old. Its wide branches grow low towards the ground and appear like arms attempting to scoop handfuls of fresh green grass. We have arrived at the very end of Harbor Road. You will find a sheltered yard on your left which is affectionately referred to as the Old Yacht Yard. There is a ramshackle old shack here that seems completely in character with the purpose for which this area is used–fishing and sailing. Indeed, a number of colorful buoys hang from the rooflines of this shack and a number of old boats that have seen better days sometime lies upturned in the yard. 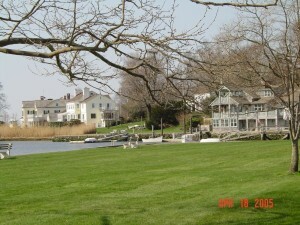 Fish are said to come to spawn at this confluence of the Mill River and Long Island Sound which makes it a fertile fishing ground for enthusiastic anglers. 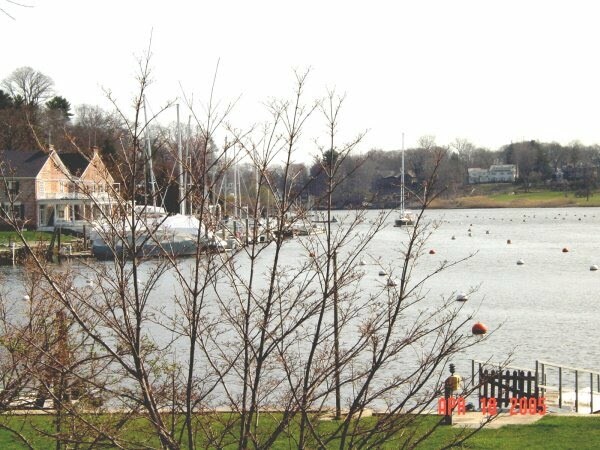 It is not unusual to see cars parked in the yard as drivers out for an aimless spin around the town stop here to watch the boats come in to Southport Harbor or encourage young anglers to stay the course and hope to get some heartening pickings for their evening meal. The houses that you see in the picture on the left are found at the very end where Harbor Road meets the sea. They are wonderfully evocative sprawling homes with picture-perfect porches and shuttered windows. Here too you can pause and take a break on one of the benches that face the waters of Long Island Sound. Breathe in deeply to smell the salty tangy of the North Atlantic Ocean. Listen to the raucous cries of the seagulls as they swoop for a catch or mimic a cheeky cuckoo as it sings its joyfulness at the coming of spring. But if you’d rather continue your stroll through Southport Village, join us as we continue down Old South Road and Willow Road which will bring us back to Pequot Avenue.